The stimulation of the immune system thanks to the release of T-cells and salivary immunoglobulin A which is triggered by laughter. Researchers at the College of William and Mary have found that “a wave of electricity sweeps through” the entire cerebral cortex (the whole brain) just before we laugh – this supports the theory that humor can actually help improve cognitive functioning by activating all parts of the brain simultaneously. When it comes to humor and laughter, it’s not all fun and games. The types of things that people consider to be funny today are very different than what was viewed as humorous in the past; changes in social norms means that “clean” jokes need to focus on poking fun at situations or the person telling the joke, rather than being sarcastic or harmful. In general, jokes that mock a particular ethnic, religious or minority group (such as homosexuals) are no longer considered to be funny by most people, nor are jokes about physical or mental disabilities. A good rule of thumb is to make fun of yourself, not others. Increasing your exposure to “clean” humor on prime-time television, online and in books will help build your comfort level with what types of jokes are considered appropriate and non-offensive. To gain to most physical and mental health benefits from humor, try to laugh every single day. Look for ways to schedule humor into your daily routine: subscribe to a “Joke of the Day” email, read the comics in the daily newspaper or watch a funny television show. Once you make laughing a daily habit, you will begin to enjoy the numerous health benefits of humor. 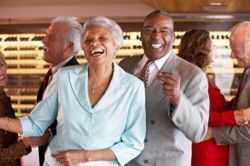 Alzheimer’s Disease: Remember to Laugh – A brief paper on the value of laughter as a coping tool for both caregivers and patients affected by Alzheimer’s Disease. The Healing Power of Laughter – An easy-to-read, presentation-ready summary on laughter, types of humor and social norms. The Connection Between Laughter, Humor and Good Health – A printer-ready handout that summarizes the connection between health and humor. Humor and Laughter May Influence Health – A four-part series from researchers at the College of Nursing, Indiana State University which examines the connection between health and humor. Association for Applied and Therapeutic Humor – This non-profit organization is dedicated to the promotion and advancement of therapeutic humor; they maintain an extensive collection of humor resources and support networking between professionals through membership and an annual conference. A Joke A Day – Website that features new, clean jokes daily. Users can sign up to have a free joke sent to their email daily. Pruneville.com – Website featuring pages with both “clean” and “not-so-clean” jokes targeted towards 50+ readers; content updated weekly. Everyday Wisdom – Online collection of clean jokes and humorous short stories. Everything Zoomer – Features a daily joke/humorous short story aimed at readers aged 50 and better.